I love one pan dinners that are quick to prepare but taste like they took all day to make. 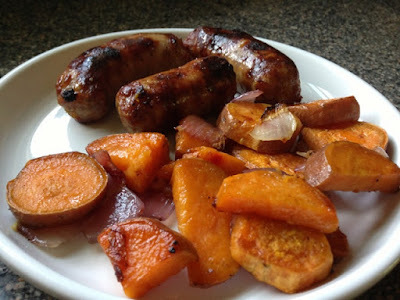 This roasted sausage dinner with sweet potatoes and red onion is simple and so basic, but full of wonderful intense flavors. It has become a family favorite so I make it often. Cut your potatoes into 1/2 inch pieces. You want them to be small so they cook quickly and get crispy. 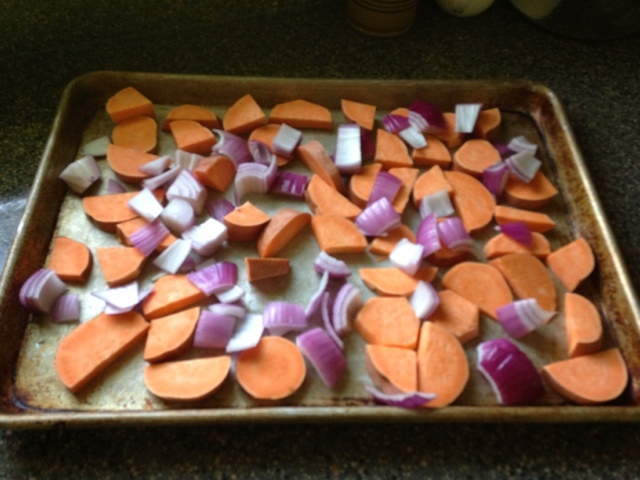 Dice the red onion into a large dice and spread over the pan. I bought my sausage in a long rope form so I sliced it into 4 inch pieces. 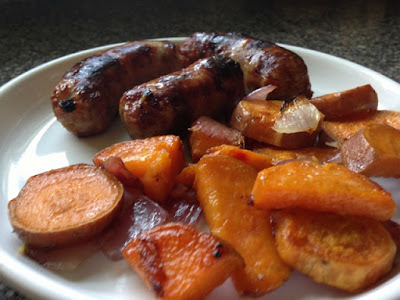 If you live local I recommend the Hatfield rope ferry sweet sausage at the Coop (at the meat counter). It is our favorite sausage. Put your sausage on the pan with the potatoes and onion. 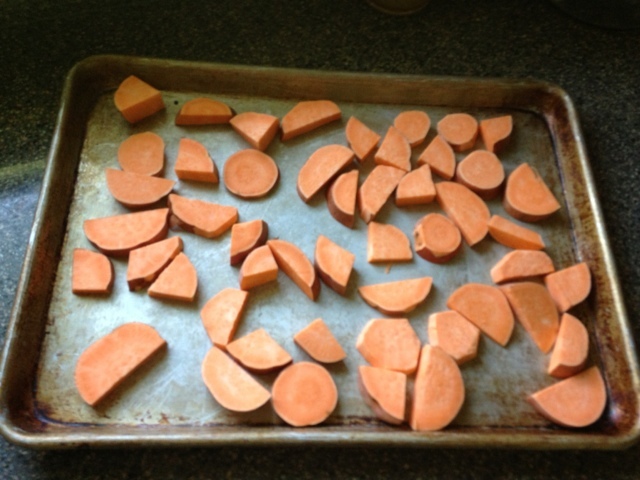 Add a tablespoon or two of olive oil and salt and pepper. Use your hands or a large spatula to mix the veggies and oil. 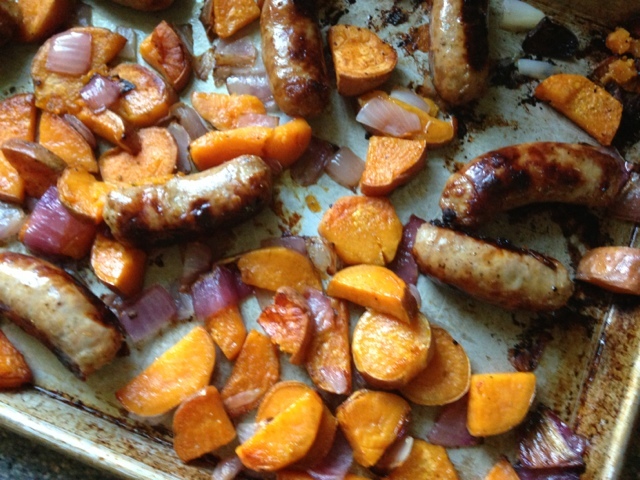 Cook for 20 minutes and the flip the sausages and veggies over. Cook for another 15 minutes or so until the other side is browned. The onions and sweet potato get carmelized from roasting and taste sweet and delicious. 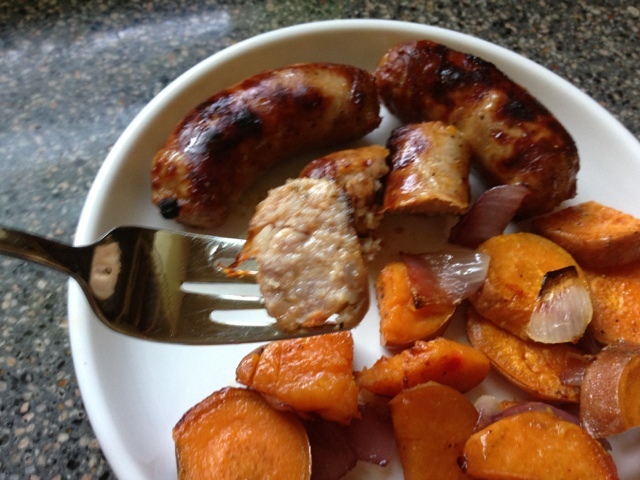 The sausage is juicy and moist and literally the flavor just pops in you mouth and awakens your taste buds. 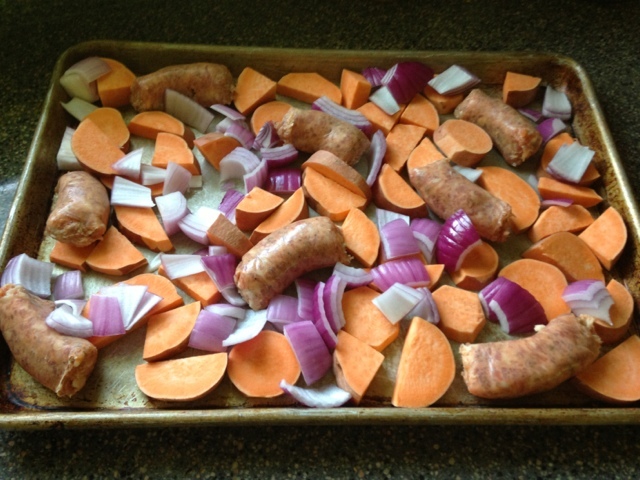 This one pan meal is super easy to prepare, eat and clean up. Sounds and looks delicious! 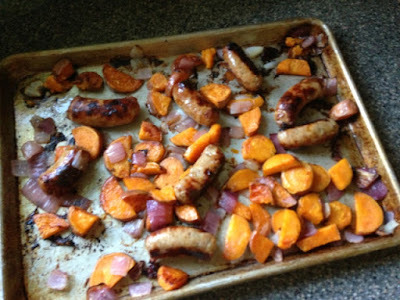 I'm not sure if my dh would go for the sweet potatoes, but we could always try. :) Nice to see you here, Andrea; thanks for sharing! 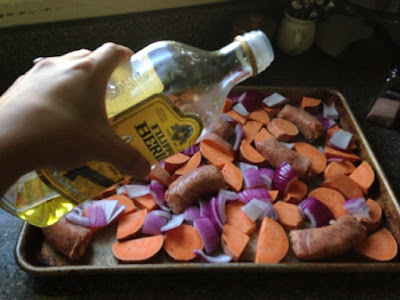 This has become my GO-TO recipe! The flavor just explodes off the plate, thanks to the sausage, and the sweet potato adds that extra healthy kick. Thanks for sharing!